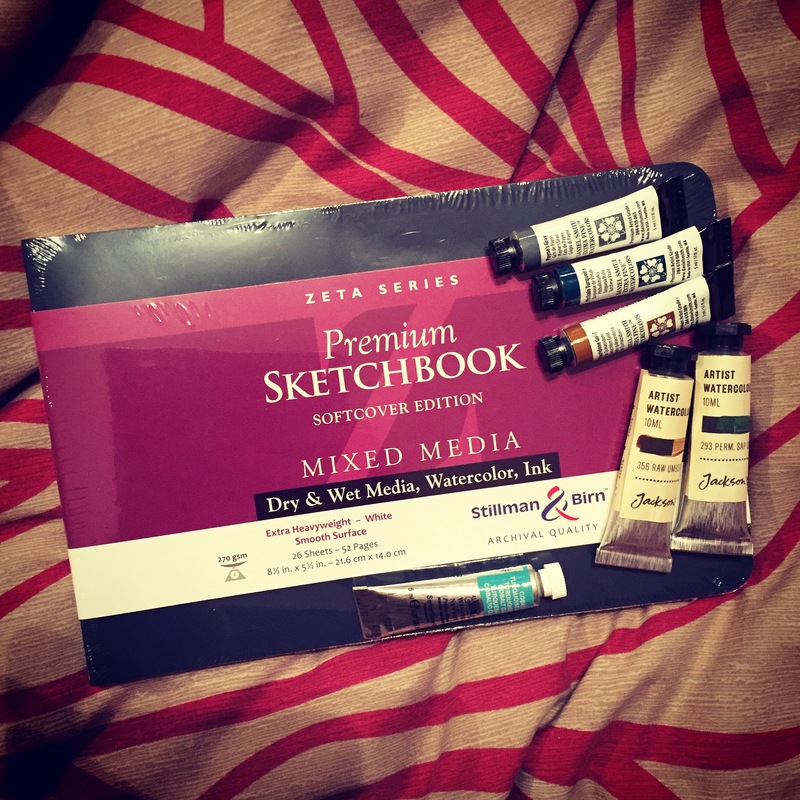 Sketch Tools | Travel Sketching & Illustration - Explore My Sketchbook! This is an introduction and explanation of the sketch tools I carry around with me when I travel. My favourite watercolour sketchbook to use is by Moleskine. It’s a landscape journal, you can draw across a double page spread to get a nice wide perspective. Its hardback so nice and sturdy to chuck in your bag and travel with. It has a pocket n the back so you can collect tickets and leaflets from places you visit. It has an elastic band to keep the book closed. It has decent watercolour paper and is affordable. It is roughly A5 sized (but as mention in a landscape format). It is the ‘large’ sketchbook, not the pocket one which is much smaller, roughly A6. It’s a nice size to carry around and do the occasional sketch in, but I much prefer the larger size for regular travel sketching. I have bought something different to try next though, a Stillman & Birn Zeta watercolour sketchbook, it is landscape orientation again, probably the same size as the Moleskine and with a softer cover. I shall give you my thoughts once I have started using it. I now have two watercolour boxes. This is a very recent occurrence. 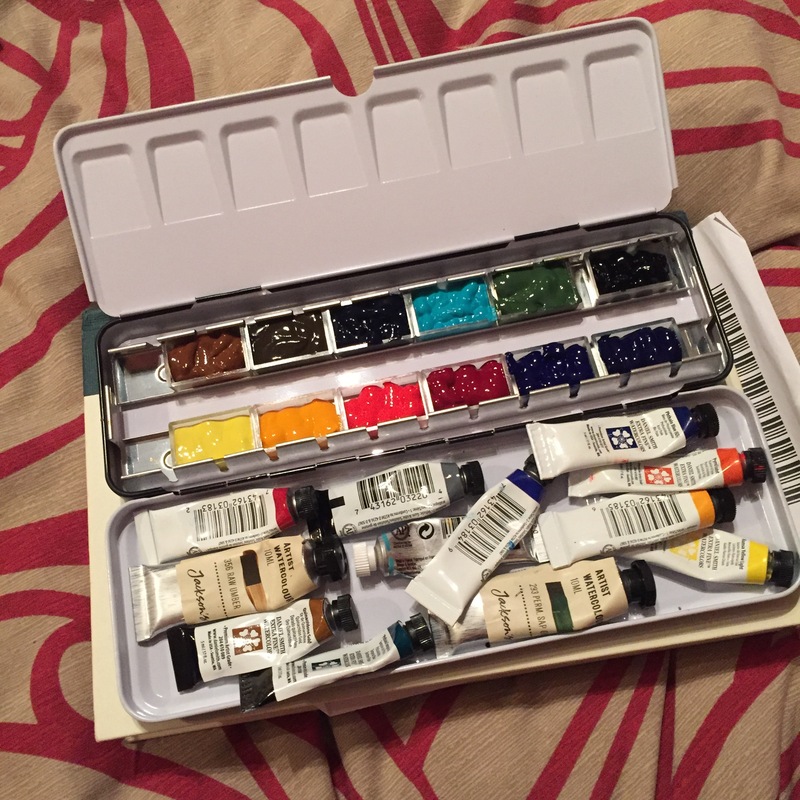 When I first started urban sketching, I used this small student grade set by Winsor & Newton which is a great size to carry around, and also conceal if you are a little nervous with sketching in public. 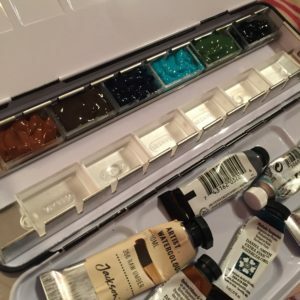 About two years ago, just before Christmas, I saw that Jacksons Art were having a sale on watercolour boxes, and there was a Winsor & Newton artist grade set that was half price (I would link to it but seems to have disappeared from Jackson’s website). My sister kindly treated me to it for a Christmas present. There is quite a difference between student and artist grade sets, predominantly in pigmentation. I used to get very frustrated that my pictures looked so washed out and wondered what I was missing. It took me a while to feel confident (before making the financial investment) that it was probably because I was using student grade paints. I am certainly not disappointed, the artist grade pan set did make a difference. A little while ago I bought this 6 tube set from Daniel Smith. I kept seeing Daniel Smith paints being mentioned on every website, blog, interview or video with artists I admire and follow. They are quite pricey. Consequently, I tested the colours, was blown away by how bright and pigmented they are…and then did not touch them for ages! I was almost too scared to use them. I did not feel worthy. However, finally, I have started to explore transferring watercolour paint that comes in tubes into pans. I have made my first (rough) attempt at squeezing them into the empty pans. I bought an empty metal watercolour tin and clipped the pans in. They then harden and you can use them to travel with as you would a normal set. There are various YouTube videos on how to do this. You do have to wait a couple of days for the paint to dry out, so bear this in mind if you decide to do this too. I now have a selection of colours I picked myself, from various brands such as Daniel Smith, Jacksons Art own brand and Winsor & Newton. I started out using this mixed set of UniPin pens, just because that was what available and not too expensive. They have waterproof ink and the different sized nibs are great for when you want to do fine details or broader looser strokes. I then heard rave reviews about Pigma Micron pens – so I bought a mixed set of those once the UniPin’s had run out (which took a very long time). I actually didn’t like the Micron pens as much, I felt they ran out quicker (but possibly I was just drawing more?) and the nibs are a bit fragile. I just wasn’t a big fan, but most people are, so perhaps draw (no pun intended) your own conclusions. I am back to UniPins now – mainly because I got given a bunch of them for free after doing some filming for an advert for Posca pens (same brand). To be honest, I think any technical pens will do the job, as long as they have waterproof ink. In the case of Microns, they are archival quality too which is great if you’re doing commissions etc. Not essential by any stretch – sketching with a fountain pen just feels good for some reason! It is a popular tool amongst many urban sketchers. A lot of them use a Lamy Safari, which I also use too. They are affordable and you can buy a little converter so that you can refill with permanent ink rather than just Lamy cartridges, which do not have waterproof ink in them. It can be a fun effect sometimes but if you want to use the pen regularly for sketching and using watercolour over the top, waterproof ink is a must. I use Platinum Carbon ink which seems good, I have not tried any others yet. I have a Medium nib on my Lamy Safari which I personally feel is too thick for the size of sketchbook I work in. I think I would like to try the Fine nib or even Extra Fine. Read the descriptions carefully on Amazon or whichever retailer you are buying from. A lot of shops (at least in the UK) have started stocking Lamy Safaris but they all seem to have the standard medium nib. I hope that gives you a good overview of the equipment I use, along with what I used to use when I started out. To be honest, you can’t go too far wrong, most of it is just a preference thing rather than something being good or not good. The only way to develop a preference is to try various things. Mostly you just need any old pen with waterproof ink, some watercolour paper and a cheap box of watercolours. Get into the habit of sketching first and then build from there.